The FA Women's Super League season gets under way on Sunday, and the BBC will show a game every weekend starting with Arsenal Women v Liverpool Women. You can watch that game at 12:30 BST on BBC Sport online, the BBC Sport app and connected TVs. You can also listen to live commentary of reigning champions Chelsea against Manchester City on BBC Radio 5 live at 14:00 BST. The Women's Football Show returns to your screens on Sunday on BBC One and BBC iPlayer from 23:30 BST. Eilidh Barbour will be joined by former England and Arsenal player Alex Scott for the first show to deliver all of the highlights and major talking points from the opening day of the season. 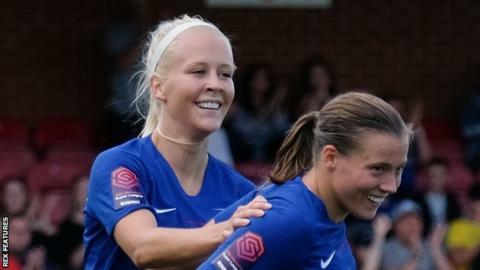 The BBC Sport website will feature a live text commentary of Sunday's matches along with selected live text sessions throughout the season, plus a written match report on every WSL1 game. There will also be online reports of Chelsea and Manchester City in the Uefa Women's Champions League.